The Curiosity rover's instrument-laden robotic arm is front and center in this mosaic view captured by the Mars rover's NavCam system and assembled by Marco Di Lorenzo and Ken Kremer. The colorized black-and-white imagery was captured on March 23. Click on the image to see the full panorama. After a week of down time due to a computer glitch, NASA's Mars Curiosity rover is once again sending back pictures of its rocky Red Planet locale at Yellowknife Bay. 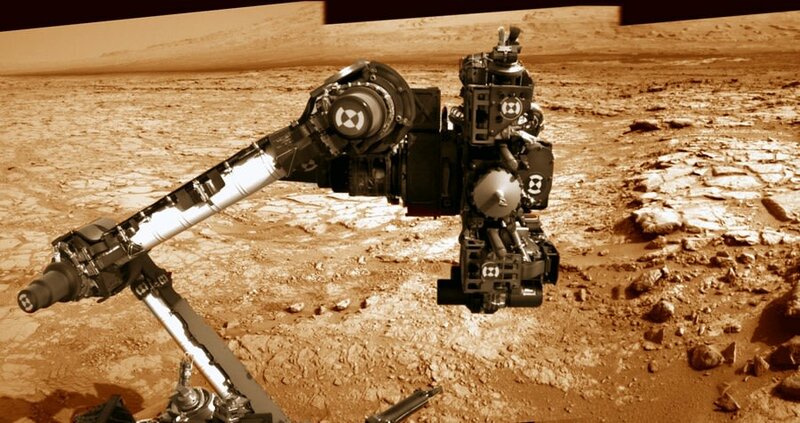 In this fresh panorama, the rover looks as if it's sticking its drill-equipped robotic arm right in your face. "That drill is hungry, looking for something tasty to eat, and 'you' (loaded with water and organics) are it," jokes scientist-writer Ken Kremer, who collaborated with Italian colleague Marco Di Lorenzo to assemble the panorama. Curiosity's percussive drill played a key role in the science team's most recently reported breakthrough: the finding that powder drilled out of a Martian rock contained the chemical traces of a life-friendly environment that existed on Mars billions of years ago. The team's chemical analysis of the powder indicated that the minerals were probably formed in the presence of drinkable water. That kind of water no longer exists in liquid form on the Martian surface. The place where Curiosity is currently working may have once been in the vicinity of a riverbed, but it's now a cold and dry wasteland of sand and rock. In the weeks to come, Curiosity's scientists plan to drill into the rock again, looking for confirmatory clues about the potentially habitable environment in the Red Planet's past. The plan has been held up due to a series of minor setbacks — including a memory failure that may have been due to a cosmic-ray strike, a precautionary stand-down to weather a solar storm, and most recently a computer file glitch that put the rover into safe mode. The Curiosity team has been carefully bringing the rover back to full operation, and this picture is presumably part of the checkout process. It won't be long before the rover will once more have to reduce its contact with its handlers back on Earth, due to an Earth-Mars-sun conjunction that will interfere with radio signaling. 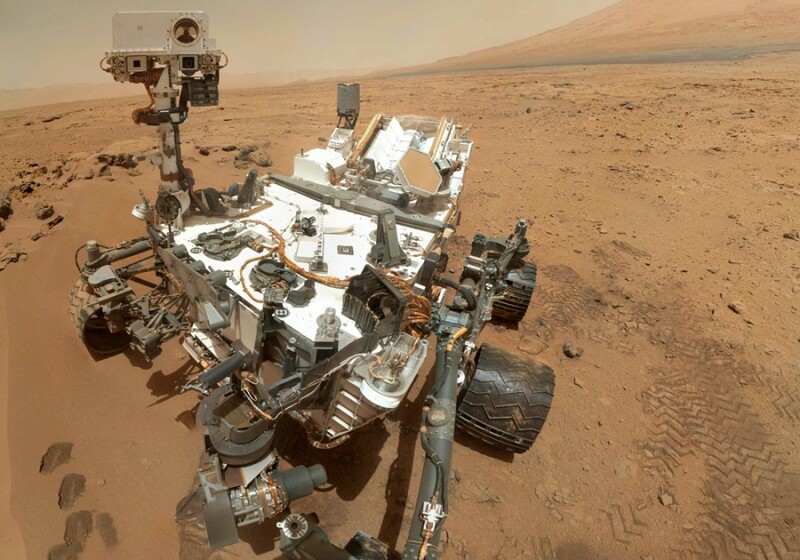 Curiosity's communication gap is expected to last from April 4 to May 1, as detailed in a mission update from NASA's Jet Propulsion Laboratory. During the break, Curiosity is expected to carry on with its experiments, but the transmission of science data and images will have to wait until May. So let's enjoy these fresh images while we can. For more of Curiosity's raw imagery, check out the galleries on JPL's Mars Science Laboratory website. You'll also find great pictures on UnmannedSpaceflight.com, where Kremer, Di Lorenzo and other image-processing gurus post their work. If you have 3-D glasses, whip 'em out and take a look at Ed Truthan's red-blue view of Curiosity's first drilling site.